Pika Environmental : Why the Pika? 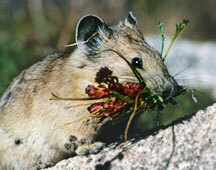 The American Pika is considered an indicator species for detecting ecological efforts of climate change. 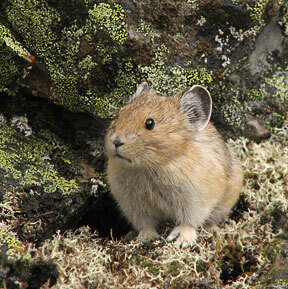 Pikas live above the tree line in boulder fields surrounded by meadows on mountain peaks. Although they thrive in colder temperatures, they avoid the summer heat by seeking the cool crevices under the boulders and by remaining inactive during warm periods. Despite the long, cold, snowy winters at high elevations, pikas do not hibernate. Pikas spend summers industriously gathering flowers and grasses and store them in "haypiles" for food to sustain them through the long winters. These "boulder bunnies," which weigh only a third of a pound, must collect more than 60 pounds of vegetation to survive the winter. Global warming threatens pikas by shortening the time available for them to gather food, changing the types of plants that grow where they live, reducing the insulating snowpack during winter, and, most directly, causing the animals to die from overheating.